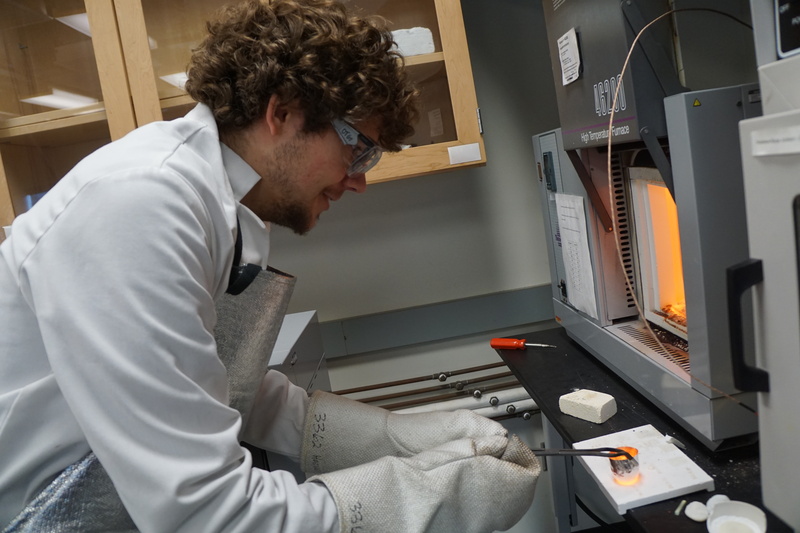 Johannes Betz conducts research in the glass and optical materials lab. 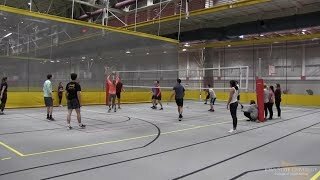 What brings a student all the way to Ames, Iowa from Münster, Germany? For Johannes Betz, it was the promise of expanding his battery research and achieving his goals of creating a sustainable future. Pursuing a master’s degree, Betz knew he wanted to expand his studies and go abroad. He reached out to his professors in Germany, asking them if they knew of research groups that would allow him to pursue his interest in batteries, solid electrolytes, and glasses. 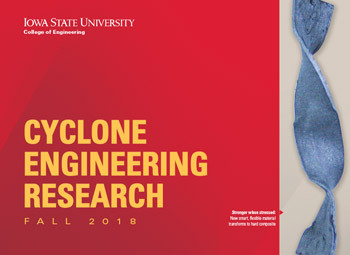 This led him to two groups: Distinguished Professor in Materials Science and Engineering Steve Martin’s Glass and Optical Materials Group here at Iowa State University, and another research group in England. Betz said he chose Martin’s group because it would allow him to delve deeper into his interests. Betz pursued chemistry and specifically battery research because he was interested in saving the environment and building upon sustainability efforts. He felt the chemistry field would provide him with the most interesting and challenging paths for exploration. He was introduced to physical and electro-chemistry early in his academic career and looked at where he could continue his study in those areas. His desire to combine his interests in physical and electro-chemistry and apply them to improve sustainability and battery storage led him to the University of Münster, where their battery research center is one of the leading establishments for battery research. Betz has been able to expand on this research since arriving in Ames on January 20. Working with the ion-conducting glass sodium borosilicate, Betz uses impedance spectroscopy to measure the impedance, or the frequency of the ambivalent voltage, which is applied to the glass. There are different batches of glass and Betz hopes to improve the mechanical stability and the conductivities of the glasses through these studies. His research here also presented Betz with an interesting opportunity to learn how to melt glasses himself. Betz has had the opportunity to work with most of the members of Dr. Martin’s Glass and Optical Materials research group. Specifically, a group of about four students were working on the same types of glasses as Betz and so he was able to fit in with their projects seamlessly. With his unique schedule, Betz has been able to conduct research in a way that might have proven difficult for some of his peers. 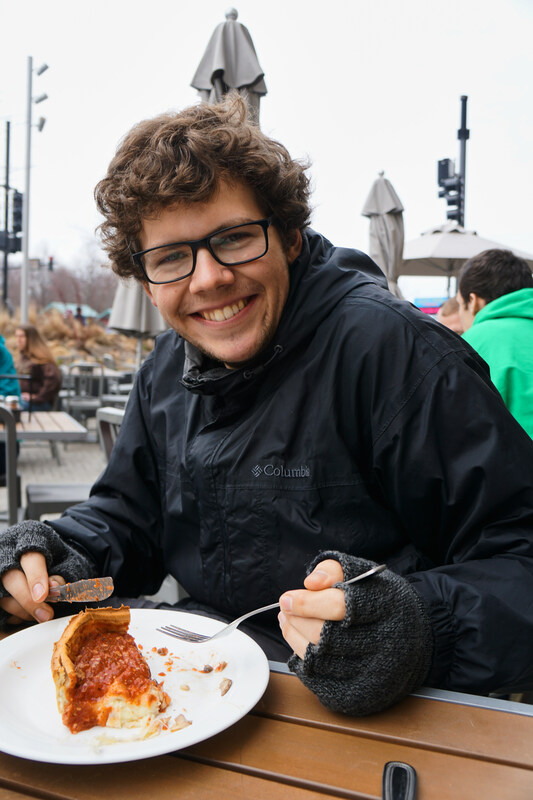 Betz enjoyed some deep-dish pizza on a trip to Chicago. When he was not conducting research, Betz could usually be found with his roommate, materials engineering student Carter Francis. Betz spent a few weekends with Francis and his brother Taylor in their Minnesota hometown, where Betz went cross-country skiing and watched volleyball and hockey games. Over spring break the trio went on a trip to Denver and Estes Park, Colorado. Betz’s brother was able to join them for that trip, and the four enjoyed the snowy sights and sound of the mountains. Here in Iowa, Betz was able to visit Des Moines and ride his bike around Ames. He enjoyed visiting State Gym and was able to attend an Iowa State Cyclones basketball game at Hilton Coliseum when the team played TCU. Betz noticed the difference between the U.S. and Germany when it came to college sports. Francis has been by Betz’s side for many of these adventures, and it is a bond that Betz cherishes. Betz will get a chance to return the hospitality this summer when Francis heads to Germany for a summer research experience. Betz hopes to take Francis around Münster via bike, particularly to see the city center and the beautiful surrounding areas. Betz said that Francis is looking forward to riding a high-speed train and Betz hopes the two can visit Berlin and some other favorite spots of Betz’s. He also plans to take Francis to see the Betz family. “My parents are quite interested in meeting him because I’m telling everyone how great he is,” Betz said. 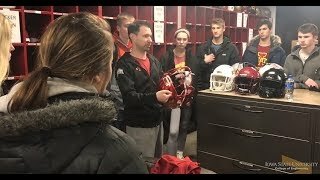 While Betz is looking forward to returning to Germany and seeing his family and his girlfriend, there are a few things about America and Ames that he will miss. Betz also happened to single out a particular beverage he will miss when he leaves Ames at the end of May.